Nine young Zapotec men in their 20’s and 30’s bedecked in bold primary colors – red, green, yellow, black — and crowned with feathered headdresses the size of a large moon, leap and twirl into the air, shake rattles and raise a carved and painted wooden talisman to the sky. They are reenacting the Spanish conquest through dance as an annual ritual of remembrance. The accompanying band, a crew of both veteran and youthful musicians, play flutes, cymbals, drums, trumpets, tubas, clarinets, saxophones, in an oompah-pah cadence reminiscent of a Sousa march with hints of German polka. They chant and speak a conversation between Moctezuma and Cortes, in which Cortes says there will be a special god that will come in the appearance of Cortes and conquer the Aztecs. The entourage includes Malinche, the Aztec princess who learned Spanish, became courtesan to Cortes, and betrayed her people according to lore. Two masked clowns, the buffoons, parade between the dancers and along the sidelines, make mocking gestures. Village children represent the Spanish soldiers in a parade that takes place before the dance begins. Click here to see short documentary film “Dance of the Feather: A Promise & Commitment” on YouTube. This oral and performance history is centuries old, transmitted generation to generation as homage to indigenous survival. While the Spaniards decimated the native Mesoamerican population by as much as 95 percent as a result of disease (smallpox, influenza, etc.) and superior weaponry, the rich cultural traditions have nevertheless survived. The Dance of the Feather existed before the Spanish conquest, according to Uriel Santiago, one of the dancers I talked with. Originally it was an Aztec ritual dance to communicate with their gods for rain, sun and corn. The Aztecs dominated much of Mesoamerica, including the Mixtecs and Zapotecs of the Oaxaca region. When the Spanish conquered the Aztecs, they had not seen the dance in Tenochtitlan, the Aztec capital. 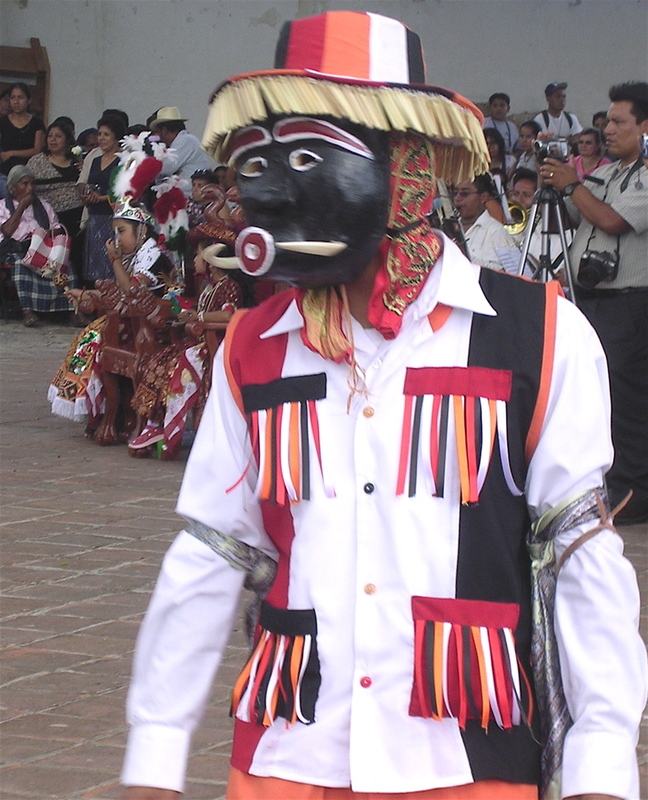 Bishop Manuel Gricida Martinez first saw the dance in the Mixtec village of Cuilapam. He thought it was a great way to modify tradition and incorporate the new Catholic religion – so most of the music and songs used in the dance are now Spanish and French. The Spaniards also introduced long pants and the big feathered crown that we see today. The dialogs were designed by the Spaniards to prove the power of the empire. In Teotitlan, Uriel tells me there are three different codices with three different dialogs, and there is a controversy about which one is the accurate version. 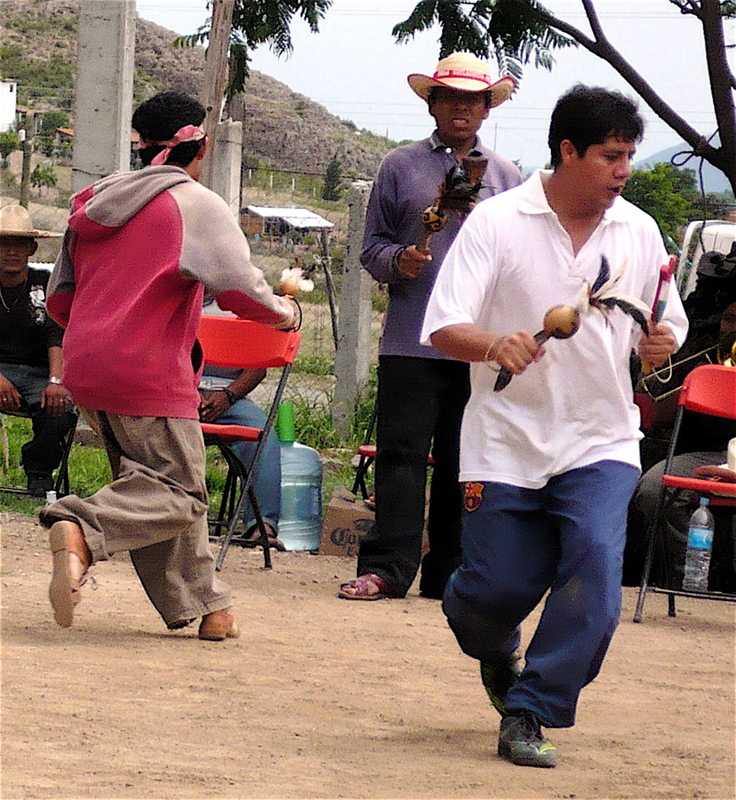 At least 10 villages in the Oaxaca Valley have their own version of the Danza de la Pluma that is held during the week honoring the particular village’s patron saint. 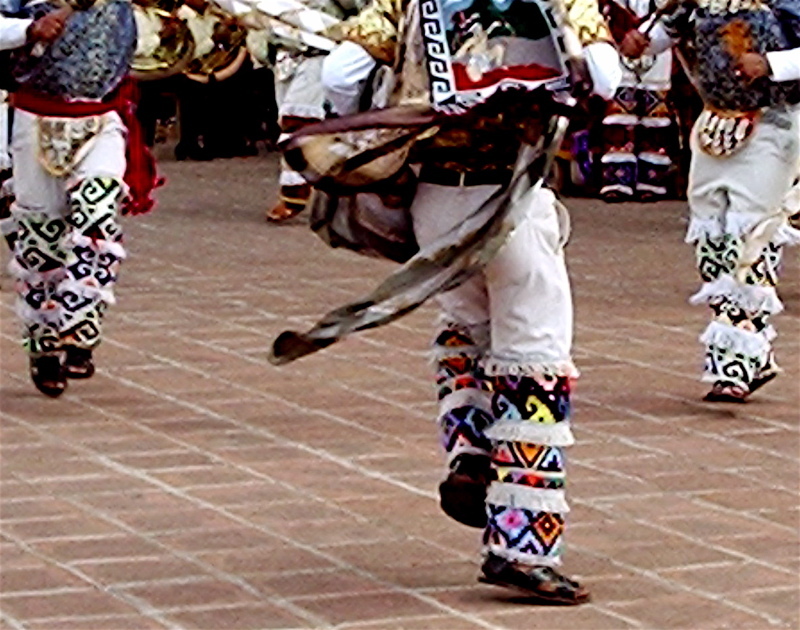 Each village uses similar dance patterns, however Teotitlan del Valle costumes are much more elaborate. 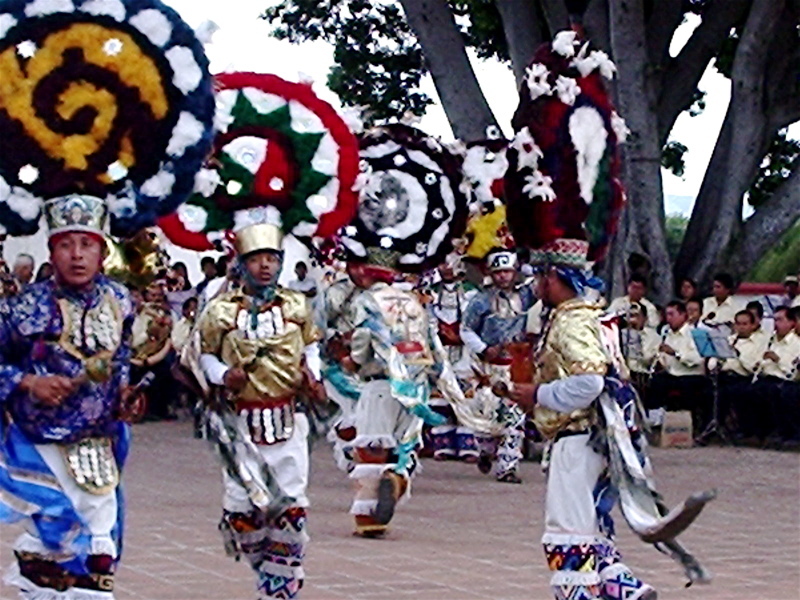 In Teotitlan del Valle, the Danza de la Pluma is scheduled to start this year on July 9 (this is one week later than usual). Practice for the actual three-day dance-a-thon is grueling. 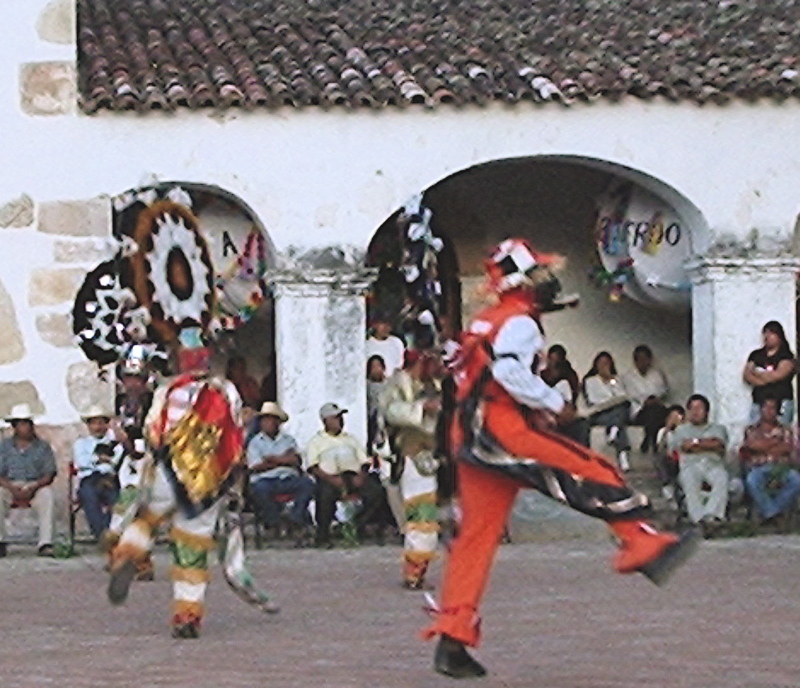 There are at least 15 different complex dance sequences that are performed continuously in the church plaza for 10-hours. The dancers, who volunteer as part of their practice to give back to their community, make a three-year commitment, and each group has a teacher who designs the choreography and dialogs. The teacher has told the dancers that they can adapt the dialogs, so it is difficult for Uriel to know the true history and he believes it is likely that the original dance is lost. What does remain intact, he says, is the dancers’ commitment to the village Church of the Precious Blood and its saints. He loves the emotion of dancing, the interdependency of his dance partners, and the link of the dance to his faith. This week I attended the all-day practice held in the front yard of the Moctezuma, Manuel Bazan, in preparation for the July 9 event. 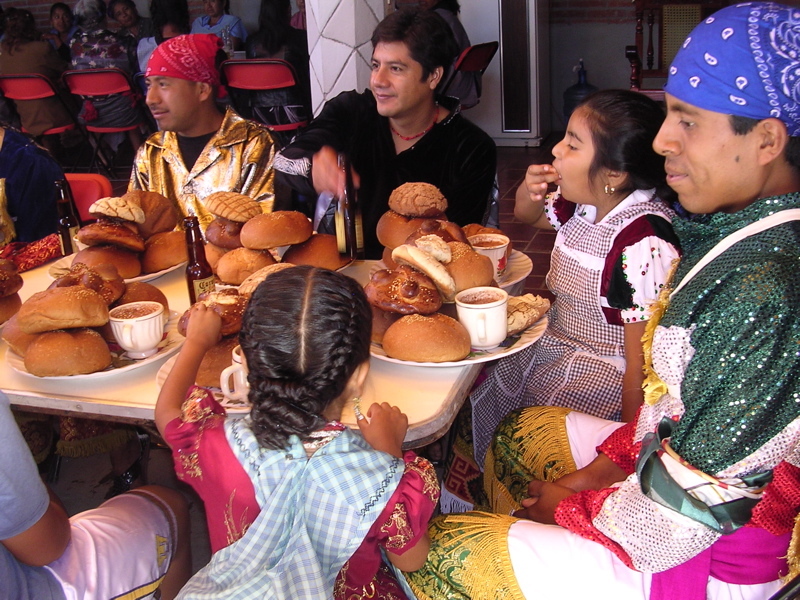 The wives, mothers, and sisters of the dancers and musicians had already gathered early in the morning to begin the meal preparations for afternoon comida, to which we were invited. At 3 p.m. the music and dancing stopped, the men took their seats at table and raised a traditional toast. The fiesta tradition is to toast first with two shots of mezcal followed by two Corona Victoria’s. The women, who included a physician, the director of the kindergarten, teachers, vendors and merchants, served traditional chicken soup flavored with Yerba Santa (a delicious herb), followed by a platter of roasted chicken, vegetable mix of fresh corn, nopalitos (cactus), and carrots, spicy black bean refritos, and plenty of fresh corn tortillas hot off the comal (tortilla griddle) made with locally ground maize that was discovered and cultivated here more than 6,000 years ago. Sitting across the table from me was Jorge Hernandez Diaz, PhD, professor of sociology at Benito Juarez University, the Oaxaca state university. 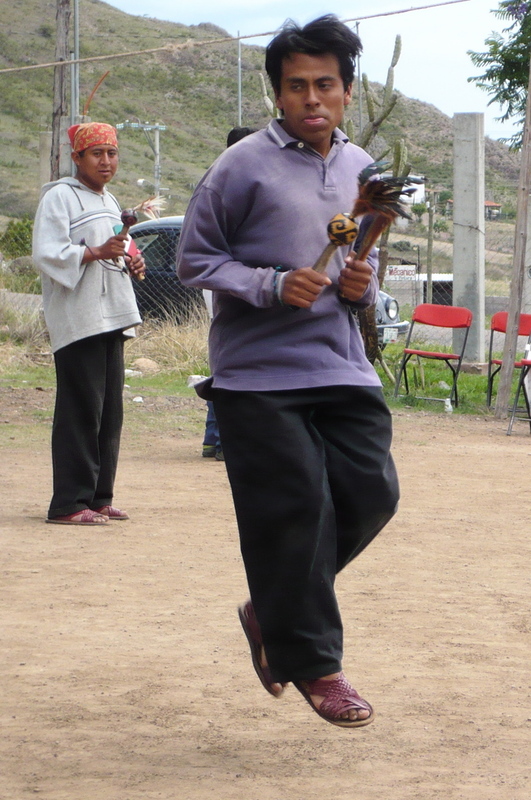 A graduate of the University of Connecticut, he has written numerous books about indigenous culture and documented the Dance of the Feather as performed in various villages throughout the Oaxaca Valley. 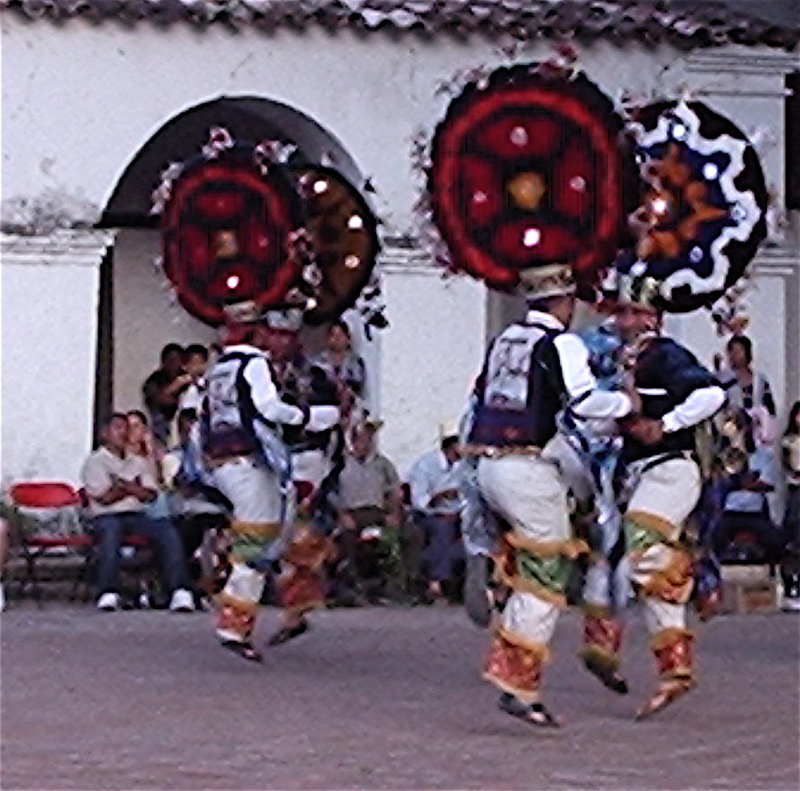 The Guelaguetza, the state organized dance extravaganza for which Oaxaca is famous, features La Danza de la Pluma for 10 minutes during the weeklong event. This hardly does justice to this centuries-old tradition, he told me. We talked about how necessary tourism is for Oaxaca in order to preserve these historic cultural traditions, how weavers and carvers and potters depend upon tourism in order to continue their art and craft, and how concerned he is for the future of this culture because tourism, which fuels the economy, has been dropping off since 2004. 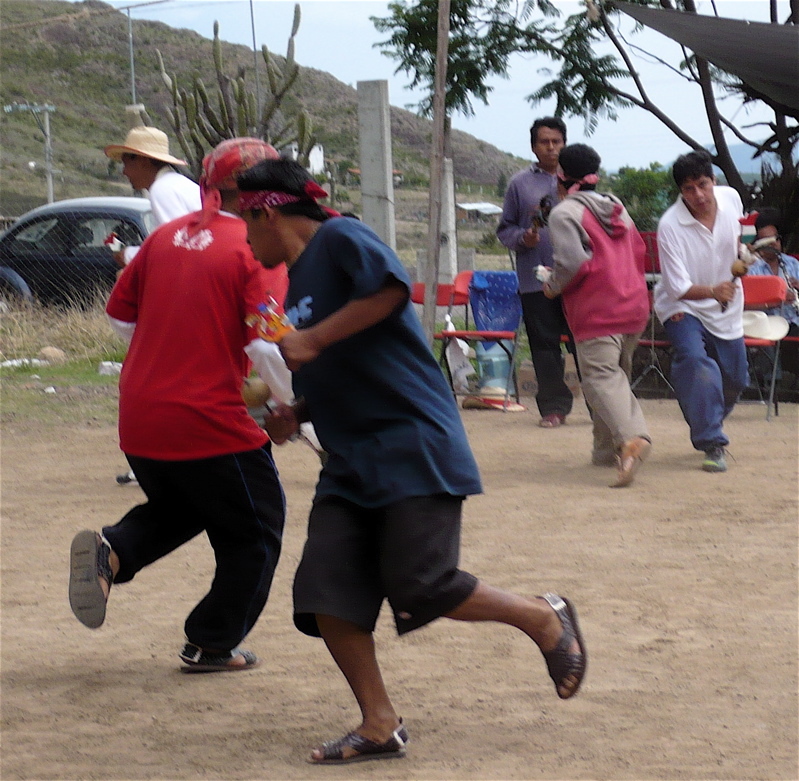 Professor Hernandez Diaz talked in particular about San Martin Tilcajete as an example of what is happening. 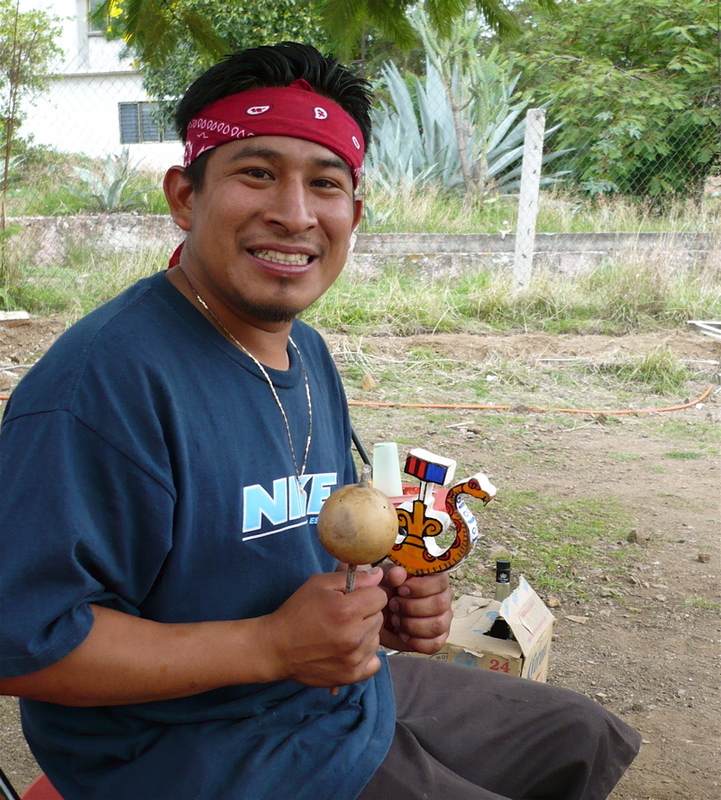 Here many very talented carvers have left the village and their art behind to work in bigger Mexican cities or to go to El Norte. Only the most famous and commercially successful have been able to make a reasonable living. The professor is calling San Martin a ghost town. For me, cultural preservation is by definition a delicate balance. I believe we have a responsibility to be respectful and tread lightly as we explore indigenous cultures – whether they are here in the Oaxaca Valley or other parts of the world — in order to sustain and promote traditional lifestyles and art forms that are in danger of being lost. One important way of doing this is to promote and support people to continue to create by valuing their time and the quality of the their work. This will help them stay in their villages with their families, rather than going off to a distant land to earn a living –something that most don’t want to do. So, for example, when I talk in my blog http://oaxacaculture.com and website www.oaxacaculture.com about preserving Zapotec natural dyeing techniques and formulas, this about being willing to compensate weavers and paying a higher price for a textile that is woven with cochineal, indigo, moss, or pecan shells because the process takes so much longer to complete – and being enough of a knowledgeable collector/consumer to know the difference between a piece made with synthetic (and toxic) dyes and those made from natural plant and animal materials. My blog captures search engine terms. Many people are inquiring about safety in Oaxaca since the APPO and teacher demonstrations of 2006. 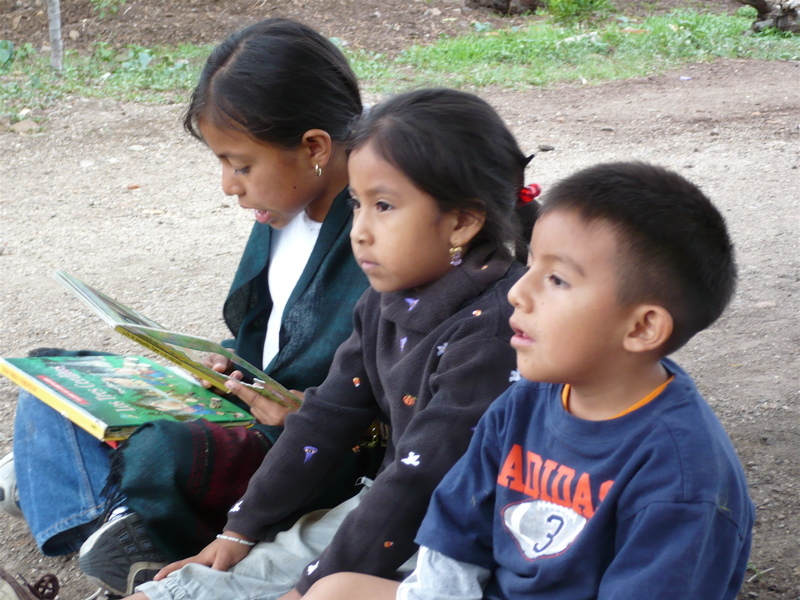 We travel to Oaxaca several times a year and are building a casita here. The city and surrounding environs are safe, secure and inviting. The people are warm, open and generous. Please don’t hesitate to visit! 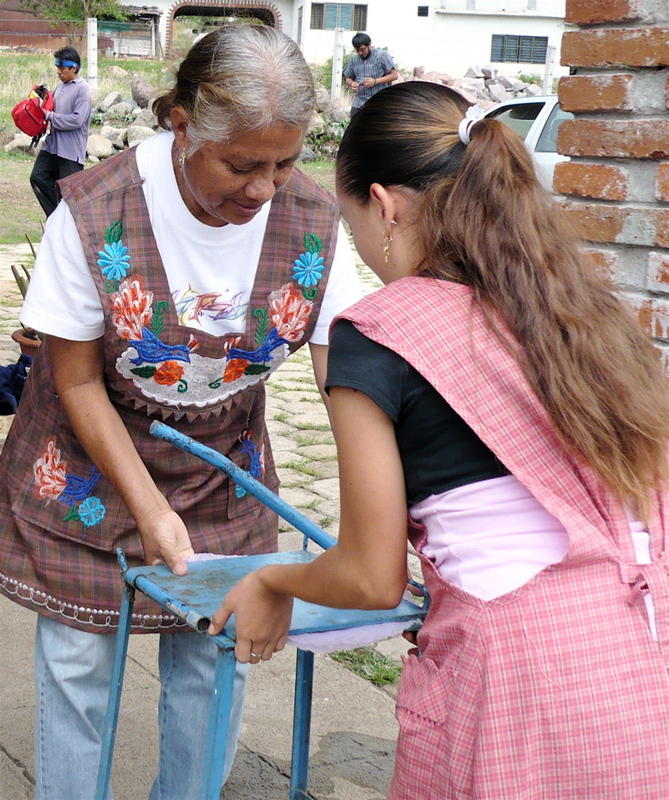 Temezcal is an ancient Zapotec ritual practice that continues today. I’ve had two temezcal experiences, both in Teotitlan del Valle, that were authentic and memorable. There is something bonding, intimate and spiritual about sharing a temezcal with someone you care about. Plus it’s really fun. I took my most recent temezcal at the home of a Chavez family relative who lives next door. We entered the courtyard around 6:30 p.m. and were led to the rear of the property where we saw the low adobe mound that looked like an oversize oven. We smelled the wood fire and met the two elderly women who would attend to us. Me, my girlfriend Sam, young friends Janet and Elsa, were all bundled up because it was winter and it was cold outside. Dolores was with us, bringing along water and extra blankets. We took our clothes off in the dark and piled them on chairs and wood planks that we could barely see, then an arm stretched out from within the temezcal cave to give us a hand and guide us in. Sam and I went first, crawling, head down, naked, through the U-shaped opening one at a time. In the corner was a wood fire, a bucket of water, and a pile of hot rocks. It was all smokey hot and steamy. The floor was covered with leaves and branches of chipil, a sweet smelling herb brought down the mountain from Benito Juarez. Sam and I laid down next to each other, bellies to the ground. The two ladies spoke softly in Zapotec and I could see the outline of their bodies and feel the sweep of an arm across my back, switching the fragrant herbs in the air to create heat and a sweet aroma. Then I felt the brush of herbs on my back and arms, back and forth, back and forth, to release the heat from my body. I could feel Sam’s skin warm, soft and sticky next to me and the soft mat of herbs on the floor of the temezcal against my belly. Everything was warm and soft and steamy and smokey. There was one woman beside each of us, naked, pressed close. It was a hoot when in the language every human being understands — the motion and push of hands — that we were told to exchange places with each other and turn over. I won’t describe it here! The only thing possible thing that we could do was climb over each other in the dark and be sure we didn’t poke any sensitive parts. I could hear the sizzle of water on the hot stones, kept my head down and my nose covered with a wet cloth. The heat was intensifying and I could feel a breeze generated by the switching herbs. Then, I heard the oinking of pigs. I thought, where’s that coming from? When we could bear the heat no more, we crawled out, limp, wet and totally relaxed. Dolores wrapped us in layers of blankets and we rested on the straw mat while the younger girls had their turn (it was their inaugural temezcal). And, then, I heard it again. The loud grunting of pigs. Yep, the temezcal was right out there next to the pig stye. We rested until the heat in our bodies dissipated, sipped water, kept our heads covered, and were told not to bathe for 24 hours. Why, I asked? It’s the custom, I was told, and that was the end of it. It was nearly 9 p.m. and all we wanted to do was go to bed. I’m certain there are more luxe experiences in Oaxaca City, but what could be better than this?